Card counting is a strategy used by players to win in blackjack and other games similar to blackjack by learning a player’s advantage through probability. There are various counting systems players can use, but in this article we will examine the high-low system. Here are the basic steps in counting cards. 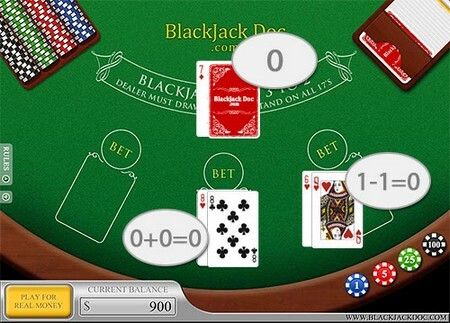 Understand the rules of the game of blackjack. You can find this information on the Internet, through books, from experienced players, etc. Know the fundamental technique for a blackjack game of six decks while making use of the Las Vegas standard rules. Obtain a normal deck of cards containing 52 playing cards. Shuffle the deck of cards. Take note of the formed combinations. Also make a mental note of the cards that make pairs or those that cancel out each other. Know the values of the different cards. Cards that are marked Ace, King, Queen, Jack or 10 have a value of -1. Cards marked 2, 3, 4, 5 or 6 have a value of +1. Cards marked 7, 8 or 9 have a value of 0 (zero). Create flash cards or a chart of the basic method and rules. Memorize it until you know it by heart. Practice counting the deck down until you can accomplish it in less than or equal to 25 seconds. To make it easier, practice pairing cards that will cancel out each other. Once you’re in the casino, remember that when the true count is higher or equal to +2, then it is time to bet. To determine the true count, just get the count and divide it by the number of decks left in the play. There are a lot of distractions in casinos like bells and whistles, a continuous flow of free drinks, and even attractive waitresses. The greater your proficiency in card counting before you go to a casino, the greater the chance you will win a cash prize. Practice card counting so as to enhance your skills. Begin playing at acknowledged online casinos in order to increase your level of comfort and improve your skills. If the true count is less than or equal to +3, then take an insurance. When betting, make use of the Kelly formula. Do not drink alcoholic beverages when counting cards. A single drink can have a negative impact on your skills to divide, multiply, subtract and add. Card counting does not assure a win. Even the best card counters can lose a game. Counting cards is not against the law, but because a casino is a private property the management of the casino can ask anyone to leave if it suspects that person is card counting. This does not occur often, although sometimes casino personnel will approach a player suspected of card counting and inform her that in the future she can participate only in games other than blackjack. Keep in mind that gambling is addictive. Seek help if you suspect you have a problem with gambling.